The thing about conventions is that they were absolutely incredible. Where else could ponies go to dive into the deep recesses of their most brilliant obsessions? Nowhere else and when the topic was Daring-Do, nothing less than a full dive was even possible. Well, as far as Pathfinder was concerned. She was sure more than a few fair-weather fans would say otherwise, probably protesting costs or something as inane as that. Maybe it was because she had a sugarmare or maybe it was because she didn't care, but a Daring-Do convention was worth thrice its weight in bits and that was one heavy load of bits. It was Daring-Do. She would go anywhere for that. She had gone anywhere for that, in almost every ense. Geographically, she had bounded across the width of Equestria in an attempt to emulate her. Physically, she had succeeded in emulating Daring-Do down to the feather, from the way she was toned and what she wore to the color of her dyed feathers, mane, tail, and pelt. Mentally, she had hammered her very being into line with daring-Do whenever she was outside of the safe trappings of- well, of a con. Pathfinder was a sincere admirer, a devotee of the written word, and admitted to a crush on her own self-made original character. Pathfinder was an obsessed fangirl, and she was darn proud of it. So proud that she had attended the last sixteen conventions devoted to everypony's favorite actionmare, written reams upon reams of highly (personally) rated fanfiction, debated theories with other fanclub presidents(who to a pony had to throw their hooves up and give in to Pathfinder's overwhelming logic power). She had written hundreds of letters to the author and despite receiving more envelopes from his lawyers- that she promptly disregarded- she did have a few letters from him personally that she treasured more than the priceless rubies of collapsed civilizations that she sometimes held in her hoof. So it was no surprise that she was attending Daringcon Heartland XI, even if the new venue was alien to her. Most ponies knew of Ponyville, at least by name, as it was a growing city in the very heart of the nation. But with bigger cities close by and with larger space available, why Ponyville? Well, the Heartland Convention Center was brand-spanking new as was the hotel it connected to and these things were just a few miles south of the town. Being new, there was some prestige in being the first event to take place and after a short biding war that may or may not have been cut short when Pathfinder stole the treasury ledger of the main accountant for Landcon- an event dedicated to Earth ponies and one expected to play well in Ponyville- Daringcon had won and it stood as the first event ever in the complex. Pathfinder had arrived a full twenty-four hours before the con and promptly made camp outside the complex. Many would arrive and have to check into the hotel but Pathfinder had no such plan- she was bringing someone and they had a room, but they weren't coming the day of the con! Silly mare, Pathfinder chose the better option and slept outside of the gates. Nopony could ever get in front of her- nopony. The rays of light that slammed into her face woke her up, the mare leaping up and hovering in place excitedly before she started darting across the empty space in front of the center. "Is it open yet?! Has it started?! Where's my badge?!" Pathfinder blathered on as she finally darted to the counter where she could see hundreds of shiny badges with the names of many ponies engraved into their wooden reliefs. She pressed her face against the glass, seeking her very own. "Off the glass," The harried attendant spat as he entered the small office, the unicorn unimpressed with the get-up as he took position. "My name is Pathfinder! Already paid! I-" The mare began before she noticed the stallion's stoic face shaking. The crying got to him. "Here's your badge, now for pony's sake go away!" He pleaded with her, going through the stack of badges and finding hers, moving it through the slot and into her hooves. "YAAAAAAAAAAAAAAAYYY!" She screamed, clapping her hooves together with great speed before shooting like a cannon to the front door. Which was locked for another thirty seconds. That was okay. She had the time. And the badge. And the locks. 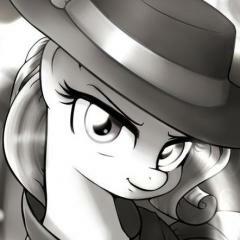 She was ready, but were Ponyvillian fans of Daring-Do ready for HER?! Snowfall was grinning wildly. Sure, the board at her company, Northern Storm Industries, could never understand her for this. She couldn't really blame them. It really didn't make sense when you stepped back to think about. She was the CEO of her own company, one of the most wealthy and powerful ponies in all of Stalliongrad; for her to take several days off from her busy schedule to attend a convention in a small town like Ponyville centered around a young adult's book series really was kind of strange, even for a mild eccentric like Snow. The successful businessmare had her reasons though, and most of them came in the shape of a spirited pegasus mare named Pathfinder. The two of them had met through a Fillydelphia based matchmaking service and after a very promising first date had been in correspondence since then. Something about the cheerful adventurer just filled Snow with a magical sense of joy that she still didn't quite understand. After an entire life of stilted and failed relationships, finally she had found something that felt organic. She couldn't be happier. In one of her recent letters, Pathfinder had mentioned Daringcon and how excited she was for it. Snowfall, in her reply had expressed how she would love to attend but wasn't sure she would find the time. This was a white lie; in truth, she couldn't have missed this convention for the world after what Pathfinder had said. She just wanted the other pegasus to be in some suspense over her appearance. That, however, wasn't the only fun she aimed on having here. Truthfully, Snow was just generally really excited about the con. Daring-Do was special to her. The character represented a wealth of wonderful nostalgia for her. In her fillyhood, she had read the stories when confined to her room to study and dreamed about soaring freely through exciting adventures with the titular heroine. In the years after taking reigns of NSI after her father's sudden disappearance, she hadn't read a single Daring-Do book. That changed after meeting Pathfinder. In the weeks since then she'd been reading through almost all of them. She had become once more a genuine fan. So here she was, the Heartland Convention Center, queued up to get her badge for entry. She had decided to dress up in costume for the event. Snowfall enjoyed wearing costumes, taking on other identities, and having fun. She still could remember the fun she had last Nightmare Night with her vampire costume. She had selected a less obvious choice for her cosplay for this event, the villain of Daring Do and the Secrets of the Forgotten Kingdom, Princess Coruscate Veil. Of the books she had read recently, Secrets of the Forgotten Kingdom had grabbed her perhaps the most (though Pathfinder's favorite, Daring-Do and the Synergy of the Saxon Staff had also been quite excellent), largely because this character resonated with her. Princess Veil was the alicorn princess of the titular Forgotten Kingdom, a pony kingdom to the north of Equestria, cut off entirely by high mountains and a thick cover of wispy clouds. She was a sympathetic villain, distrusted in her own kingdom, betrayed by her own friends and family, who falls victim to her own insecurities and gradually rises to become a tyrant of sorts as she grasps madly at a power that she thinks will set everything right for her and her kingdom, which ultimately puts her at odds with Daring-Do. For the costume, her coat had been dyed a silvery blue while her already pale mane had been dyed dull white. She wore a gilded, jeweled crown and an elegant, regal deep violet gown. A quality made false unicorn horn fashioned to her head finished the ensemble. The costume was so perfect that Snowfall doubted Pathfinder would even recognize her at first. She was going to use this to her advantage. As she claimed her badge and stepped deeper into the convention hall, she started to look for her dear fillyfriend. Which was easier said than done. Most places Pathfinder stood out easily, but here, with all the Daring-Do cosplayers, it became a little harder to discern the real adventurer. Eventually, after much persistence and innumerable double takes Snowfall found the pony she sought. There was no mistaking her and her worn out hat that had actually seen countless adventures and wasn't just a costume piece. Entirely confident, Snowfall stepped out in front of her. "We meet again, Daring-Do," Snowfall started, ready to show her acting skills. "In the name of my Veil Kingdom, you shall not foil my ambitions this time!" The lanky orange unicorn foal with the spiky teal mane, Snails bounced along happily like Ponyville was the greatest city in the world for that weekend. He was heading to the new convention center to meet up with his Best Bud, Snips. "First Daring Do Convention EVER in Ponyville! Eeeeee-heeee! This Is AWESOME! And its th' first convention of any kind here ever! Sweeeeet!" The foal had a costume in his saddlebag of a "Vampire Mosquito of Deadly Bog" his mom had made for him from the illustration in "Daring Do And the Mystery of Deadly Bog", and a Daring Do t-shirt for the con badge the fan club advised he would be getting when he signed up to attend. He planned on putting the costume on after Snips found him, but until then he could enjoy everypony else's. He scampered up and found a number of ponies were already waiting, several ponies even camped out in tents like it was Cider Season, all waiting for the gates to open. He wondered if the other tent in the #2 slot was for Pinkie Pie, but the pony exiting the absolute first tent in line was a dead ringer for Daring Do herself compared to the other cosplayers in the line! Then she was joined by somepony dressed as Princess Coruscate Veil in dazzling detail. Snails was geeking out at all the costumes, especially those two "Suh-weeet costumes! I am so going to love this convention!" Rainbow Dash was so eager for this! Her very first Daring Do Convention! She had no idea what to expect, but Daring Do was so awesome, surely this convention would be awesome, too! And Rainbow Dash was going to wow them all! She'd had the awesome idea to dress up as Daring Do, herself! Course, she wasn't so good at such things ... but Rarity was, and she'd made Dash a totally cool and really accurate version of Daring Do's outfit! A spiffy pith helmet, a olive green shirt, and she was ready to go! This was going to be great, everypony was going to be so impressed! She winged in over the convention, late as usual, but only a little late, did a loop-de-loop just to burn off a bit of excess energy, and came to a light landing in front of the new convention center. There were a lot of foals around, but also several adults, but ... wow. That was ... a LOT of Daring Do costumes! Even some colts were wearing Daring Do costumes. And more than that - there were outfits of everyone! Some of Little Circles, Daring's short-lived sidekick, and a whole bunch of outfits of the various villains. there was a group of islanders over there, and even one pony dressed up in a big, floppy, baggy blue costume with a hand on the tail that she guessed was supposed to be Ahuitzotl. Her really awesome outfit suddenly felt a lot less awesome. Heck, some of the mares here had even dyed their mane and coat to look exactly like Daring Do! Ah well. She'd still have fun! She doubted any of the con-goers here had nearly as many adventures as Dash had! All that was left was to get tickets. "Are you in line?" She was directed back further... "Are you in line?" She went... a rather disturbing distance further back. "Are you ... is this... where's the end of the line?" Finally reaching the rear, she leaned over and looked faaaaar up towards the ticket counter. Uh-oh. This was starting to feel familiar... they couldn't run out of tickets ... right? Radiant Chord landed a little ways off from a side entrance to the convention, a burly Pegasus on either side of her. Her mane had been done up in a pile on her head, and her tail had been braided, so that all in all she looked like a bit like a fashion model waiting for the rest of her attendants to finish preparing her for a run, but it was a small price to pay to be able to go to the Daring Do convention. Convention. That word still had the power to fill her with excitement. Radiant wouldn't classify herself as a fan-filly of Daring Do, but she had enjoyed the books. No, what excited her more was being able to get off of the family estate and do something she wanted to do. "Now, puh-lease try to blend in?" she asked the two black-suited guards-ponies who had accompanied her to the convention. "I know this may sound strange to you, but I don't want you herding me around, or keeping me from talking to other ponies or anything like that." One of the stallions went to say something, but quickly closed his mouth as Radiant glared at him. "Yes, I know I have the concert later. I'll be back stage plenty early for the make-up ponies to work on me, don't worry. And if I'm not... well, then you can bother me. But not before, alright? Unless it's something really important." Giving the stallions another glare, she turned and trotted into the convention, a badge already around her neck, reading 'Guest: Radiant Chord'. It was just starting to fill up with ponies, as the badge line began to move, the sound from outside the convention a veritable muted roar of excitement. Trotting off to one side, where hopefully no pony would see her, she did her best to slip into the influx of ponies unnoticed. After all, she didn't want to draw too much attention to herself. If she had, she would've asked her father for more handlers, and wouldn't have told them to leave her be. Taking a few moments to look around at all the stands set up, and all of the various costumes that her fellow convention-going-ponies were wearing, Radiant was amazed by how detailed, elaborate, and true to the books everything was. The pony in front of her made her do a double-take, even, and she had to convince herself that it was not, in fact, Daring Do. And the pony next to them! She had to remember to find out who had made that Princess Coruscate Veil costume, because that was a pony she would like to hire for her costume design for other performances. Of course, now that he was a stallion he could attend freely, but his busy farm life still kept him from having the free time on his hooves, until now. It was a stroke of luck that a Daring Do convention was actually held both so close to his home and during the down time on the farm. He was still too shy to ever dress up, but he was sure he could at least muster to courage to get an autograph or two; it couldn’t be any more difficult than getting some from the Wonderbolts! Maybe he could pick up something nice for Purple, too, though he wasn’t sure she was into Daring Do. Unfortunately, the line was already incredibly long. Groaning to himself, he quickly cantered to the back of the line, ending up behind a young pegasus mare in a Daring Do adventure outfit. What really made her stand out though was her rainbow colored mane, you didn’t see many ponies with a rainbow mane, and he’d only met one before. Come to think of it, this was probably her – he glanced at her cutie mark, but instead a Daring Do one was pasted over it, the paper colored almost exactly the same blue as her pelt. It wouldn’t even be noticeable except that he was standing right behind her. “Nice flank!” Carrot said enthusiastically, then instantly realized that had came out horribly wrong. Oh, Luna above, was he always going to look like an idiot in front of this rainbow pegasus? “Umm, Oi, uh, Oi mean, yer Daring Do cutie mark, it’s done roit nice! Roit good job!” Ach, you dumbtail, that’s a record screwup with a filly. The doors to the convention center had opened not a second too soon, and it had taken just one more for Pathfinder to blast on in on her wings for a second before abiding by convention law and staying on all four hooves, aided still by her initial flight and as such was seemingly galloping at full sprint from table to table, generally eating up the sights with her eyes. She rapid-fire shot her greetings at all staff as was her custom and neighed with abandon due to sheer overwhelming glee. One by one, the other attendees entered, and Pathfinder made it a point to greet every last one. Well, her idea of a greeting was to terrifyingly shake hooves with a wild look in her eye and tell them how excited she was. After the first dozen or so, staff had politely asked her to stop creeping everypony out. That was fine; she was just biding time until they started to open up the real space of the center and the ceremonies began, currently seeing that only the open space at the front was open to the public. She was fine, as that allowed her to go about her business. And what a business it was! Pathfinder knew she looked like Daring Do and her attitude matched, confidence defined. As ponies started to filter in, she was quickly singled out. Not due to the content of her costume as that was fairly par for the course considering the event they were at, but the sheer quality of her so-called 'costume'. She would not take the time to correct them and inform them that it was her day-to-day garb, day-to-day color, day-to-day attitude. But who was she to filter the dreams from the reality when she herself strived to make them one in the same? It didn't take long and soon ponies both big and small, though mostly small, came up to her and started asking questions about her costume and to do passages from the books. She indulged them all, striking poses and fulfilling the dreams of every colt and every filly who came up to her. Being Daring Do for the benefit of others did more for her anyway than it did for them. An orange, lanky colt gave her 'props', as the foals would say, for her costume and she returned that show of approval by ruffling his mane. He was a darling one, even if his voice made Celestia weep. "Why thank you! It IS a look I have cultivated for years!" She blasted in excitement, striking a dramatic pose. As she was posing and generally spending her early minutes at the convention indulging in the attentions of others, a certain chill shot up her spine, like the crackling fingers of the cold north trilling up her back in eager anticipation of whatever was coming next. It was the sort of cold only magic could conjure and the sort of persistence that spoke of presence and not of a spell, and of power both frothing at the mouth to be unleashed and weary of its implications. It was the voice of Princess Veil. The Stalliongrad accent that hadn't been entirely erased from the impression and the voice, while impressively masked, was one well-embedded in the memory of an adventurer who had prided herself on remembering the things she wanted to, and this voice was one thing she had willed herself to remember. "SNOWY!" Pathfinder screeched as she hopped up into the air, turned, and fell back down to face Snowfall. Her costume was magnificent, very well-done, but she hadn't changed her eye color. That didn't matter; Pathfinder liked her eyes. The adventurer, heedless of those nearby including the, gave Snowfall a deep kiss on the lips before hugging her as tight as a plushy. "I'm so happy to see you here! I knew you'd show up since I broke into the hotel and read their ledger a few nights ago. I was just trying to see if there were any surprise guests as well as where the known guests would be at so I could talk to them before they left but what did I find? Snowfall! And look at your costume! You look fantastic in it. I think it looks better than the one they used for that stage adaptation in Germaney, though she looked more directly like the character. That's not a bad thing since you're super beautiful and all! I'm going to show you all sorts of things, Snowy!" Pathfinder said, nuzzling her while grabbing her front hooves and dancing hoof-in-hoof with great enthusiasm. As she did this and spun around gaily, her gaze shot out back outside. The line was growing and while it would have nothing on the obscene size of the last convention in Fillydelphia, it was a much smaller space. Would there be enough? Her brow furrowed, then shot up as she let Snowfall go. "It looks like an awful lot of 'em didn't write-in to reserve their badges. I did, but then again I had to start about ten months ago on the day they announced this. No matter. The capacity for Daringcon Canterlot was only three-thousand, but I think I managed to sneak in a few hundred more," She said before turning to Snowy and winking. "Distracting the fire marshals makes things so much easier!" "Woah hey you're Radiant Chord you're a musician whose playing in the event am I right my name is Pathfinder-" The mare shot out at five million words a second before clutching Radiant Chord's left forehoof and shaking it with the force of ten minotaurs, "-And I'm super excited to see your act tonight!" She finished, letting the musician down. She gave the musician a quick yet deep hug and then as swiftly as she had came to the guest, Pathfinder vanished in a cloud of swiftly produced dust and appeared back next to Snowy. "That's Radiant Chord. She's a musician whose gonna be playing tonight! I was excited when they announced to the fan club presidents that she was going to play because I'd never heard of her and that sorta breaks up the fact we see the same thirty or so guests at every convention. Then they told us to keep it a secret! Ahhh, I wanted to tell everypony just because of that. She doesn't have a hotel room, though, so I can't bake anything later tonight and deliver them as midnight snacks like I will to the rest of the guests," She finished just as she realized how obscenely overexcited she must have seemed, blushing at the thought. "I'm sorry, Snowy, for being a little over the top," Pathfinder said with a hint of solemnity before prancing in place and giggling. "I'm just so EXCITED!" She hopped a few times, her wings flapping flightlessly in excessive excitement. She calmed down after a few seconds and looked back outside. "Hey Snowy, if everypony can't get in, I'm going to get them in anyways. I'll need your help!" She exclaimed conspiratorially before turning just as quickly to the foals nearby, including the tall and odd-sounding orange colt. "What's all of your favorite books?!" This was going to be so cool! Who would have thought that the annual DaringCon would happen in Ponyville!! Snips was practically bouncing as he approached the hall. He knew he was running late, but he hoped that the last minute changes to his costume would be worth it. Several ponies had tried to convince him to dress up as Small Circle. Small Circle was a colt who'd been one of Daring's sidekicks, and he was supposed to be short and stocky like Snips. But Snips had dismissed the idea: He had a better one. Zala was a huge diamond dog digger who had accompanied Daring Do on several expeditions. Snips had died his coat, mane, and tail to a dark brown. He had fake paws on all four hooves of the same color. Beyond that, his costume consisted of a red fez that hid his horn, and a blue and white pin-striped vest. "Oh my gosh! Rainbow Dash!!" he shouted out. "You like Daring Do too?" Now Snips did bounce up and down. He wished he'd brought his Rainbow Dash Fan Club shirt with him. "This con is going to be SO AWESOME!" Snowfall was surprised with the reaction she got from Pathfinder. Her costume was perfect. The crown was real and the gown had been custom made for her by a designer out of Manehattan. Only the most quality of dyes had been used on her fur and mane. How did Pathfinder see through it so effortlessly. Pathfinder seemed to know it was her before she even looked her way? Was it the voice then? Snowfall had never considered her voice all that distinct. By Stalliongrad standards, she almost didn't even have an accent really. She had also changed her inflection entirely. Had Snowfall left some deeper impression on Pathfinder that her voice was recognized instantly, even under all of that? Snow soon didn't really care. Pathfinder leapt at her and kissed her. After the weeks apart, it was immediately arresting. Something in her heart fluttered wildly at the contact. She grinned somewhat vacantly as the other pony embraced her. Few ponies had this magical effect on her. No, probably none but Pathfinder made her feel this way. It was just so very intense. She wondered a little if anyone was watching. She didn't know if Daring-Do and Princess Veil were commonly shipped, but if they were, perhaps they had inadvertently made somepony's day. "I'm so happy to see you here! I knew you'd show up since I broke into the hotel and read their ledger a few nights ago. I was just trying to see if there were any surprise guests as well as where the known guests would be at so I could talk to them before they left but what did I find? Snowfall! And look at your costume! You look fantastic in it. I think it looks better than the one they used for that stage adaptation in Germaney, though she looked more directly like the character. That's not a bad thing since you're super beautiful and all! I'm going to show you all sorts of things, Snowy!" Snow just continued to smile as Pathfinder started to speak as excitedly and as rapidly as she usually did. Somehow it didn't surprise her that Pathfinder lacked the patience for surprises so much that she'd break into the hotel to see who was on the ledger. Pathfinder's compliments were nice. She had spent a lot on making her costume perfect, so it was good that Pathfinder recognized the quality of it. "It's wonderful to see you again too, Pathfinder. I'm glad you like my costume. I probably spent more on it than most ponies would find rational," Snowfall said, looking down. "I rather like dressing up in costumes though, so I believe quality is worth the cost." "It looks like an awful lot of 'em didn't write-in to reserve their badges. I did, but then again I had to start about ten months ago on the day they announced this. No matter. The capacity for Daringcon Canterlot was only three-thousand, but I think I managed to sneak in a few hundred more. Distracting the fire marshals makes things so much easier!" Snowfall had to giggle at this. She hadn't ever realized Pathfinder was so generous. Flagrantly disregarding her own safety was one thing, but laughing in the face of safety precautions to accommodate others was another thing entirely. It was kind of noble, it a little insane. Snowfall hoped nothing bad happened. She'd hate for Pathfinder to inadvertently be responsible for any trouble. "That's Radiant Chord. She's a musician whose gonna be playing tonight! I was excited when they announced to the fan club presidents that she was going to play because I'd never heard of her and that sorta breaks up the fact we see the same thirty or so guests at every convention. Then they told us to keep it a secret! Ahhh, I wanted to tell everypony just because of that. She doesn't have a hotel room, though, so I can't bake anything later tonight and deliver them as midnight snacks like I will to the rest of the guests." Pathfinder said this after having run off to shake hands with said musician mare. Radiant Chord? Snowfall hadn't heard of her before either, but then again, music wasn't something she particularly followed closely. Classical music was a must at most of the high social functions she attended, but it never had really suited her well entirely, and she hadn't explored much beyond it. The biggest point of question here was Pathfinder baking? That was a shock. Snowfall really couldn't see Pathfinder as the type of mare to bake treats. She giggled at the thought. "Ah, I see. Does that include me? Will I get a chance to sample some of your baking?" she asked, hopeful. "I'm sorry, Snowy, for being a little over the top. I'm just so EXCITED!" Snowfall smiled. "I understand," she said. "I'm excited too. I've never been to an event like this. I'm honestly not sure what happens. Seeing so many ponies all passionate about the same thing gathered in one place, wearing the most delightful of costumes, it definitely makes for an exciting atmosphere." "Hey Snowy, if everypony can't get in, I'm going to get them in anyways. I'll need your help!" "Umm... okay..." Snow added, laughing. She wasn't entirely sure what her fillyfriend had planned, but she wasn't planning to get in the way of her mischief. Snails got his badge and came in, he found a good spot near the door to keep looking at the line. He was as wired as if he had eaten one of "Pinkie Pies Super-Sugar Shoo-fly pies" and bounced up and down on his hooves. Snails realized he had found himself in a smaller line before he knew it, meeting the biggest Darie fan of all, Pathfinder! That was her he had seen exiting the tent! And she had heard him geeking over her costume earlier and she ruffled his mane!! He giggled and blushed a bright red, his wooden con badge shining proudly with it's blue dot sticker signifying he was underage for some events. His blush deepened and he turned aside in a gentlemanly way as the mare greeted the Princess Coruscate Veil he had also admired earlier, in a very... enthusiastic way. Snails took that moment to get back to the main door and watch for Snips. His eyes widened as he saw a rainbow mane way back in line "No wayyyyy! Rainbow Dash is coming here too?! BEST! CON! EVER!" Snails did a happy dance, standing on his back hooves from sheer joy! Snails stopped dancing and turned back toward Pathfinder. He answered cheerfully "My fae-o-rites are Daring Do and th' Griffon's Goblet, Daring Do and th' Gardens of Equestria, Daring Do an' th' Mystery of Deadly Bog... Oh an' Daring Do and th' secrets of th' Forgotten Kingdom! Ah hope ta' get "Synergy of the Saxon Staff" here at th' convention." Why am I even here? Crescent asked himself once again, not only was he hardly a Daring Do fan, but he didn't really care much for the books at all. He of course knew that they were pure fiction, but the series had still managed to bring him quite a bit of annoyance whenever ponies learned of his line of work and instantly tried to compare it to a Daring Do novel, he was getting tired of constantly having to tell them that the real world was nothing like those books. He'd gone into a fair number of ruins, temples and caves, and not once had there been any ingenious traps or villains waiting for him to ruin his day, sure there was the occasional pitfall, hidden chamber or dangerous creature, but nothing at the level of the Daring Do stories. He'd only gone to a single Daring Do convention when he was younger, and only because his Canterlot friends had urged him to go, it was shortly after he had gained his cutie mark and he still remembered how the fanponies at the convention had thought his golden compass mark to simply be a fake, a tribute to Daring Do. If it weren't for the fact that his last client had given him a ticket to the con as a bonus for a job well done, he very much doubted that he'd gone. But now he was here, standing at the back of the line after being in no rush to be one of the first inside, brown fur covering his well trained body, his blue mane as windswept and unkempt as always, and his piercing ice blue eyes observing the line of congoers in front of him. He wore only a pair of simple saddlebags, one of their contents, a book on archeology, currently open and levitating in front of him, covered in the blue magical aura created by his horn as he read parts of it every time his inquisitive gaze failed to find anything interesting in his surroundings. It was to his big surprise when a rainbow colored pegasus mare in a Daring Do costume suddenly landed on the ground behind him, taking his position as the last pony in the line. He'd heard hear ask about the end of the line from a bit up front, and when she landed at the end she looked a bit crestfallen. Upon silently taking in her appearence again, he quickly discovered that this was in fact Rainbow Dash, Element of Loyalty and resident of Ponyville. Her rainbow colored mane and cyan fur making it quite obvious. He couldn't keep a teasing twinkle from his eyes as he returned the book to his saddlebag and turned halfway around to face her. "Hey there, welcome to the end of the line. I just hope they'll still have room for us when we finally make it to the entrance. Nice costume by the way." He said the last part with a smile, doing his best to keep the teasing tone from his voice when he mentioned the part about the limited space. Crescent never was a cruel pony, but Rainbow just looked much too distressed for him not to poke a little fun at her. Radiant Chord simply stood there, stunned for a few moments. What had just happened to her? Blinking a few times and awkwardly putting her hoof down, she looked around the convention space for the mare that had surprised her in a whirlwind of speech and hoof-shaking. Finally spotting extremely excited mare, standing next to that beautifully done Princess Veil pony, she spent another moment or two looking for her handlers. It wasn't hard to spot them, hovering near the edges of the crowd of convention-going ponies and looking very... stern. Radiant glared at them, and shook her head 'no', as they were clearly rather... upset about that experience just now. Taking a deep breath to compose herself, Radiant trotted on over to the Daring Do and Princess Veil ponies, having to thread her way around others, wings held tight to her body so she didn't accidentally hit any pony. "Hello there," she said when she reached the two of them, speaking louder than normal to be heard over the crowd. "I don't believe I caught your name just now." The speed at which the mare had said everything had made it hard for her to understand half of it, other than that she was excited to see Radiant at the convention. "And I wanted to tell you how amazing your costume is." Turning to face the Princess Veil pony, she gave them a friendly smile. "And yours too. You must tell me where you found that dress... I'd love to hire them for some of my concert designs." Her eyes widened a bit, as she realized she hadn't introduced herself to this other pony. Yes, every pony wore badges with their names on them, or at least carried them somewhere, but it was still polite to introduce yourself to a stranger. And having not been able to hear the excited mare's words over the crowd, she had no idea she was probably making a fool of herself. "Oh, please forgive me, I haven't introduced myself. I'm Radiant Chord." Rainbow Dash jumped in surprise at the voice behind her, turning quickly to face Carrot. He looked vaguely familiar, like she'd met him somewhere before. "Uh ... right, um, thanks!" she said, hesitantly, then grinned. "I mean, yeah! I had a friend's help, but it's an awesome costume! And of course, I fit it quite well!" She struck a pose, a broad grin on her face. Then it clicked. "Oh, hey! You're that stallion! With the package! Did you ever find the post office? I mean, ha-ha! Course ya did. So what are you doing here?" Then another, and another of the ponies around her started chatting. One was a little foal wearing a really floppy and silly looking costume ... like.. a ... dog? Yeah, that's it! That fez! He must be Zala! "Sure do, Zala! I'm looking forward to it, too!" But the pony before her in line suddenly turned and started talking to her, too. Golly, they sure were friendly here at the con! Were eggheads always this talky? She always pictured them as being ... well ... non ... talky. Except for the big words, she supposed. But weren't they supposed to be all awkward and stuff? No, wait, what had he said? "What? They couldn't, could they? Run out of room?" This was the annual cider sale all over again! Her heart leapt up into her throat. She leaned to the side and peered past the other pony, up along the long, long line. "Not again! I just *gotta* get into this con!" Snowfall was in excellent spirits as she described her costume, her experienced and wordly ponyness not stopping her from coming down to 'their' level and wallowing in such delicious nerdiness and fandom as spending such time and effort on a costume. Of course, smart ponies like Snowy were naturally attracted to such awesome and incredibly academically rewarding stimulants like the Daring Do novels. And they were naturally attracted to being attractive and she was very attractive in that costume! "How much did you end up spending on your awesome costume? How long did it take? It was definitely worth it, sweetie. You look better than most of the gals who do this for a living!" Pathfinder said excitedly, desiring to boost her mare's disposition even more before the doors officially opened. She then playfully nudged Snowy. "And of course I'll save some treats for you! How else did you think I was going to test them and make sure they're safe? I'm not going to use foals!" She said, beaming at the orange colt nearby who was busy answering her question, taking in his answers with some manner of cheer. They were solidly foalish but were still pleasant reads. "Aww, I remember when Gardens of Equestria was my favorite! I was only a little bit older than you, cute little colt. Did you have a crush on Outback Jack too?" She asked and winked at the colt, lamely giggling as she remembered that stallion was one of few dozen filly crushes. Few hundred. Okay, closer to a thousand bit who was keeping track? Workers at the orphanage that she had grown up in, that's who. She smiled as she turned back to Snowy. "Well, not after the last time, anyway. You'd never guess it but mixing in some herbs I found in the Everfree and foals creates one heck of a problem that needs to be solved through zebra magic," She finishes, pawing Snowy's face in a joking fashion before nearly recoiling in horror as she mentioned that she had never been to an event like this- to a con. It nearly drove Pathfinder to tears. "Awww, well, lemme tell you what's going to happen then. Eventually, these big doors will open up and we'll flood in like a river whose dam I may or may not have weakened on accident. There are all sorts of panels and events, but beyond those things, you can just walk around and socialize and even buy stuff. You get to do all sorts of things and I made sure to copy down every event on this handy-dandy schedule!" She pushed a hoof-written schedule into her face, a series of words and abbreviations, lines and times that would have appeared to be some foreign language had one of them not been half-insane and the other a businessmare. "I'm sure they'll sell official schedules, but I attended every fan club meeting so I know what's what and where, when, why we should go and who should come with me- like you!" She pulled Snowy in close for another extremely tight hug just as Radiant Chord spoke. It was wonderful to see that the musician wasn't adverse to interacting with her fans, even if they were less directly fans and more so just in the same place and time. That worked well enough for Pathfinder's sake. "My name's Pathfinder, adventurer extraordinaire and Cloudsdale President of the Daring Do Fan Club! This here is Snowfall, and she's a very important pony! CEO of Northern Storm Industries, and she's so cool, and nice, and pretty, and funny, and smart!" She bellowed, more or less feeling as though she was placing giant neon signs with fingers pointing towards her all around the Stalliongradite. "And thank you, but this isn't a costume, just my day to AHHHHHHHHHHHHHHHHHHHHH!" Pathfinder shouted with unrestrained and chaotic joy before galloping through the crowd unheeding of any cause other than hers. The gates were being opened and just as the first sounds of the wooden blockade scraping against the wooden supports were heard, she blasted through the crowd. The gate wasn't even a quarter of the way up before she reached it and slid under, on the other side before the two gate raising ponies could summon the power to care about the fanmare. On the other side of the gate, Pathfinder stood on her haunches and clapped her front hooves together, her words of joy becing caught up in her overwhelmed throat, not caring that the mingling staff and associated ponies were shooting her daggers. "Oh Sweet Celestia, not her." Crescent couldn't help but chuckle lightly as he saw the almost panicking rainbow pegasus, he normally didn't poke fun at ponies like this, but her reaction was much better than he'd expected. He watched her in silence for a while, quickly realizing that this was not the first time this had happened to her. Suddenly feeling a bit guilty that he'd teased her about it, he decided to do his best to cheer her up. The earth pony behind Dash spoke to her again, trying to reassure her that there'd be more than enough room for all of them, Crescent simply nodded his agreement as they continued moving. "He's right you know, I mean, this is a pretty big event and I'm sure there's more than..-" He was cut off as he saw some staff members trot to the front of the booth. "Enough..." He continued as he saw a sign being raised, his eyes widening slightly as he saw what was written on it. "Tickets." Crescent finished with a gulp as he turned back to Rainbow Dash with an apologetic smile. "Or well....maybe not?" He wasn't able to keep an awkward wince from his muzzle as he looked at Dash's reaction. "How much did you end up spending on your awesome costume? How long did it take? It was definitely worth it, sweetie. You look better than most of the gals who do this for a living!" "Between the high quality non-toxic coat and mane paints, the 24-karat gold bejeweled crown, the custom made designer gown, and the realistic synthetic unicorn horn, I'd estimate conservatively 2,250 bits for the entire ensemble," Snowfall answered with a steady nod. That was probably ridiculous for a costume, but she figured perfection came at a price. "And of course I'll save some treats for you! How else did you think I was going to test them and make sure they're safe? I'm not going to use foals! Well, not after the last time, anyway. You'd never guess it but mixing in some herbs I found in the Everfree and foals creates one heck of a problem that needs to be solved through zebra magic." Snowfall gulped. With these words, her excitement to try Pathfinder's baking was replaced with a small amount of fear. It also further convinced her as to just how terribly reckless the other mare was. Giving unknown herbs from the famous Everfree forest to foals? That wasn't exactly the right thing to do. Snow sighed. Pathfinder's recklessness really was going to get her in trouble one of these days. "Well, better me than the foals, I suppose," she said with a laugh, smiling. "Awww, well, lemme tell you what's going to happen then. Eventually, these big doors will open up and we'll flood in like a river whose dam I may or may not have weakened on accident. There are all sorts of panels and events, but beyond those things, you can just walk around and socialize and even buy stuff. You get to do all sorts of things and I made sure to copy down every event on this handy-dandy schedule!" Snowfall nodded steadily as the other pony explained what was going to happen. It sounded like fun to her. She looked at the schedule. it was a little confusing, and Snowfall wasn't entirely sure what the abbreviations all meant, but she could make sense of some of it. She looked back up at Pathfinder and smiled. "It sounds delightful," Snowfall said with a laugh. She supposed it didn't sound all that different then some of the business conventions she had attended as a presenter, except of course here she would one of the many in the crowd instead of the top billed guest. In a lot of ways, she definitely preferred that. "I'm sure they'll sell official schedules, but I attended every fan club meeting so I know what's what and where, when, why we should go and who should come with me- like you!" Pathfinder said this before hugging her tightly again. She grinned. It really was great to see Pathfinder again after so many weeks apart. It was then that the musician, Radiant Chord approached them, inquiring about them and their costumes. "My name's Pathfinder, adventurer extraordinaire and Cloudsdale President of the Daring Do Fan Club! This here is Snowfall, and she's a very important pony! CEO of Northern Storm Industries, and she's so cool, and nice, and pretty, and funny, and smart!" Snowfall sighed again. Pathfinder was almost too much. She was planning to be pretty low key here; part of the point of having such an exceptional costume was to get away from her normal identity. She wasn't sure there were any ponies in this crowd who would recognize her, and if it did get out that she was here, she had absolutely no clue what the Stalliongrad press would make out of it. A lot of ponies already did doubt her. That's why she tried so hard to be as strong and confident as possible when it came to actual business dealings. That said, this convention was definitely more pleasure than business, so here she felt more free to express her more playful whims. "Oh, but I know not of what you speak, my fair mare!" Snowfall started in a playfully over the top voice, smiling toward Radiant Chord. "I am Princess Coruscate Veil, scorned scion of the great Veil Kingdom!" "As for my comely gown, it was fashioned by the most consummate of my court artisans, using only the splendid of textiles!" Snowfall started with energy. She then giggled wildly, sighed and took on a more normal speaking tone. "Actually, I had this dress fashioned by a high end designer out of Manehattan. I could give you his name, but to tell the truth, though this piece turned out fine, he was a little fussy to work with. There's a designer I've ordered from before right here in Ponyville who can produce work of this quality at a lower price and has yet to give me any problems though. Her shop is called Carousel Boutique. Perhaps you could arrange something there?" As Snow was speaking, Pathfinder flew off back toward the entrance. She just shook her head and smiled. The adventuring mare sure could be excitable. As the alicorn-dressed pony spoke to her in a joking, but regal tone, Radiant smiled. So this is what a convent is like? she thought to her self. I think I'm going to like it here "A fashion designer who's difficult to work with? Perish the thought!" she replied jokingly. "But I shall most certainly have to check out this Carousel Boutique that you speak of. Price isn't really the issue... but if I could work with a designer who wasn't a Canterlot-class prima dona, I'd love it." Before she finished her sentence, a gust of wind blew past her. Blinking twice, she looked around to see what could have caused it, given that they were already indoors, only to notice that that extremely excited Pegasus mare, Pathfinder, was missing. Looking in the direction of the mare-sized path left in the crowd, she saw the Pegasus already on the other side of the still-rising gates. It took a moment for Radiant to realize what must have happened, and then she shook her head slowly. "Is she always like this?" she asked, turning to face Snowfall once more. As the gate rolled out of sight, she shook her head again. "We should probably go catch up to her, shouldn't we?" she asked, though it wasn't really a question. "I hope you wouldn't mind if tagged along for a little while, at least until I find a schedule or some such. Your friend seems very knowledgeable about this convention." Dash swapped off between glancing nervously and impatiently to the front of the line, then turning back to talk excitedly about Daring Do trivia with the others. She especially liked chatting with Carrot - he was around her own age, and he didn't seem to be trying to tease her. It was a bit hard to fight through that thick accent, though - worse than AJ's! But she focused hard to try to understand what he was saying. She figured she probably got at least two thirds of his comments. As they neared the front, Rainbow Dash got more and more excited. But the sign raising up ... that smile froze on her face... became hollow as her pupils shrank... then her smile dropped to a horrified expression. She stared up at the 'sold out' sign, raising her forehooves in silent supplication. It couldn't be. It just couldn't be. Why? "I ... I ... NO!" she cried. Tears of frustration stood in the corner of her eyes. "Nooo-oooo-ho-ooooo!" She cried dramatically. "It's not FAIR! It's just not FAIR! Why does this keep happening to me?!" Silver Flash flew in from the sky, landing lightly at the front gates. Her white pelt was finely groomed, but her gorgeous blue mane had been chopped a bit shorter in preparation for her role. It looked *quite* strange in the mirror - not to be done up all glamorous. She already had a special pass hanging round her neck - after all, her big secret announcement meant she had one of the more major parts of this covention - and yet, it amused her to think - none of these congoers were likely to even recognize her! She severely doubted any of them were in any way interested in the high-class romance plays she normally performed in. Of course, that was a drawback, too. Would they believe she could even play the part of Daring Do in a major Manehattan production, in the Fainting Daisy roles she had gotten a reputation for? Not that Fainting Daisy was a bad director - he just had a certain style that she didn't want to be typecast as. Once they found out who she was, of course - and knowing how a fanbase could be, she had no doubt that somepony would do the research on her. Then she spotted someone she thought might very well recognize her! Radiant Chord had been at several of the same parties as she, and while Radiant was far more famous than Silver Flash ... they had talked a few times. Maybe she'd recognize her. And she was hanging out with a pair in the most amazing costumes! She hoped that Princess Veil had nearly as good of a costume as that in the stage production! Then she saw how Princess Veil and Daring Do acted towards each other, and a faint flush touched her cheeks. Oh, they were some of *those* kinds of shipping fans. She'd heard that Veildo shippers were rather common. Even as such, it'd be a good time to start building some goodwill, even if they'd have no idea who she was. She stepped up with a bright smile. "Well, good morning!" she said happily. "I wish I had my camera with me, because these certainly must be the finest costumes here!" Except ... the Daring Do costumer had almost instantly disappeared! She laughed, and watched the display, right out of one of Daring Do's books. "Goodness, she certainly has Daring Do's moves ... though not Dare's cool reserve." Carrot Fields felt a little impatient about being in line, mainly because he was just so excited for his first real fan convention; it was an mixture of excitement and worry. He had no idea who associated with Daring Do he would get to meet - the author? The illustrators? The editors? What would he say to them? Could he even overcome his shyness and approach their tables? Still, he didn't seem as jittery about the whole affair as was Dash in front of him, who occasionally flapped her wings and lifted off the ground to get a better view of the line. "Oi'm sure it'll be-", before Carrot could finish his sentence, the sign came into view. Sold Out. Well, wasn't that rotten luck. His first convention, and he couldn't even get in. "Nuts and shoes, Oi guess Oi'll have tae hope they come back tae town again sometime." Carrot tried to put on a cheerful face, attempting to pass off the failure to get in as no big deal. This all changed though with the young mare in front of him started her lament, even looking on the verge of crying, though Carrot couldn't tell if she was sad or angry. That was certainly a weakness for Carrot - a mare in despair. He had to do something, say something, to help her feel better, even if he couldn't somehow get tickets for them both. "Ach, now, Oi know it's a bum's deal we dinnae get in, but Daring Do would nae let this get her spirits down." He needed to do more than a pep talk though. "Say, Oi know a diner near here. We could get some nibbles, an' talk about our favorite foods over lunch, my treat!" He just gave a broad smile, hiding in vain any mild blush he may have. He hadn't exactly meant it to sound like a date, but he had just asked a filly out to lunch. Gentle Sol had always loved a good book and Daring Do was one of his Favorites nopony knew but he had a crush on the fictional character. his Gram knew this and when word came that there was to be a convention in town she bought tickets for the two of them to go. sadly on the day of the convention she got sick but sent Gentle to go because she did not want to ruin it for him. while worried for his gram this might be a once in a lifetime opportunity that Gentle Was not going to waste. so here he was outside where it was to be held but he saw a lot of ponys who were saddened by the Sold Out sign they just put. Feeling sad that he had two tickets with only himself he decided to be nice. "Umm does Anypony need a ticket i have an extra if someone wants." he called out. Pathfinder was for a few moments completely overwhelmed by the excitement of the goings on around her, each sound and word magnified in their aftertaste by the sheer terminal joy she felt. To her, every convention center had a unique smell and while this one was too new to be identified, she knew it was just a matter of time before she could place it on the wide, wild spectrum of conventions in terms of its unique flavor. Fillydelphia was tense as the throngs of ponies fought one another for basic space, Canterlot felt cold as the only ones who got in were the rich and spoiled that didn't spend nearly as much time socializing as they should have, and the Trottingham conventions which had the distinct flavor of failure and chaos as the con-runners had failed to follow through with their booking promises and ran off with more bits than they could shake a hoof at and believe you me, many hooves were shaken at them. Hopefully this would turn out better, though the sound of a mare outside wailing as rumors of the badges sold out peppered her early perception. Pathfinder looked out against the grain of the streaming ponies and could vaguely see some pegasus pony with a rainbow mane wailing in frustration. Poor mare! That was the bad thing about rules and limits, ponies often found themselves on the wrong side. Thankfully, rules were meant to be broken and Pathfinder had little regard for limits other than using them as benchmarks to pass. She stood in place as her best mare forever and awesome musician Radiant Chord drew close. "Aww, look at 'em! All sad out there, and here we are with such space. I'm going to make this right. Snowfall, if you would be a dear and wait to see if I end up being chased by Fandom again?" She said as she cantered past, poking her head up over the crowd to try and find a large and bespectacled green and pink stallion, four smiling faces on his weathered flank. After a minute, she found him. "Hey Fandom!" Pathfinder blared as she approached the fellow fan-club president. Canterlot was as fine a place as any for their formal meetings, and it was strange to see him out of the confines of the board, chasing her, in a court room pressing charges, or any of the other four dozen silly events that had taken place between them for the past ten years. Good friends, really. "Pathfinder," He responded curtly, keeping a smile as he tried to ignore the one member of the fanclub whose fanaticism made everypony else want to jump into ravines, shaking as many hooves as possible as dozens of fillies and colts streamed bu. "Where are your back-up wood carvings?" Pathfinder asked innocently as she rested herself on his back. "Why do you want to know?" Fandom asked suspiciously, voice already growing weary of Pathfinder's implications. "Going to make new badges for the ponies outside, of course!" "We're sold out, Pathfinder. No more." "Naw, we still have wood carvings so we can sell more." "It's about the space, Pathfinder. We can't..."
And so it continued for a full minute, the two going back and forth until Fandom was on the floor in a daze, rubbing his temples and on his haunches. He had injuried his legs earlier in the week when pulling a cart and was in mood to chase the hyperactive mare-filly, and gave in. "You're going to go look for them and do it anyway, even if I don't tell you, right?" "Behind the counter, about sixty more. You'll have to do it yourself. Do you-" Fandom started to ask before he looked up and saw an empty space. He sighed, hoping against hope and reality that it was the last time he'd see her for the rest of the hour. Anything more was wishful thinking. Pathfinder galloped and met Snowy, giving her a hug. "Okay, I'm going to go make badges for the rest of the ponies outside. I might be busy for a while, but I'm sure with all those bits- I don't know if I've even seen 2,250 bits in my life!- you can find lotsa ways to entertain yourself, and the opening ceremony isn't for another hout. Meet up then? And then we go everywhere together! Yay!" She bellowed before giving Snowfall a giant hug, patting Radiant Chord on the head, ruffling the mane of Snails because wasn't he just a cutie, and then trotted to the badge counter with the window facing outside. The unicorn who had given her her own badge earlier was packing up as she burst in. "What are y-" He couldn't finish as Pathfinder pushed him out and closed the door, locking it as Fandom came by and laid a solemn hoof on his shoulders. Some battles were destined to be lost. Pathfinder thrust upwards and bit the 'SOLD OUT' sign and ripped it off, wood splintering as she did so. She then poked her out into the world and gave voice to the new reality! "HEY! I'M MAKING BADGES! GIMME BITS, GET A BADGE, GO IN!" "A fashion designer who's difficult to work with? Perish the thought! But I shall most certainly have to check out this Carousel Boutique that you speak of. Price isn't really the issue... but if I could work with a designer who wasn't a Canterlot-class prima dona, I'd love it." Snowfall laughed at the mare's words. So true. She made use of many designers and so very often they were just terrible to work with. This Ponyville boutique really had been a lucky find. She had never met the owner personally, but she had always produced wonderful results based on what Snow sent her and her prices were almost too low. "Fashion definitely does attract a certain type," Snowfall said with a laugh. "But I stand by this Ponyville designer even if I've only worked with her through correspondence." Radiant asked in regards to Pathfinder. Again Snowfall had to chuckle. "It's part of her charm," she replied simply, smiling. Another pony had approached them. She was a pegasus mare with a white coat and blue mane. She looked rather familiar to Snowfall for some reason, but she couldn't quite place it. Had she seen this mare before? Snow turned to the mare to respond to her greeting. "Well, good morning! I wish I had my camera with me, because these certainly must be the finest costumes here!" Snowfall smiled back at the mare and gave a nod. "Why thank you, miss," she said. "That is very kind of you. This costume definitely is a point of pride." "Goodness, she certainly has Daring Do's moves ... though not Dare's cool reserve." The mare added, reacting to Pathfinder's sudden disappearance. Again, Snow shook her head and laughed. "I suppose that might sum her up pretty well," she said with a steady nod. Pathfinder was all lose energy; it's what made her appealing really. If you weren't used to it though, it could be perhaps a little alarming. "We should probably go catch up to her, shouldn't we? I hope you wouldn't mind if tagged along for a little while, at least until I find a schedule or some such. Your friend seems very knowledgeable about this convention." Radiant started in. Snow nodded. "I suppose we should," she replied, smirking. "And I don't mind at all." She moved to meet back up with Pathfinder, who seemed rather upset about the badges selling out. "Aww, look at 'em! All sad out there, and here we are with such space. I'm going to make this right. Snowfall, if you would be a dear and wait to see if I end up being chased by Fandom again?" She said. Snow gave a nod. "All right, Pathfinder... have fun..." she said simply. She watched the childish back and forth between Pathfinder and some other pony she knew that ensued. On energy alone, the excitable adventurer flew circles around the other and seemed to get her way, though evidently she would have to produce the extra badges herself. Snowfall wasn't surprised. She just giggled and shook her head. "Okay, I'm going to go make badges for the rest of the ponies outside. I might be busy for a while, but I'm sure with all those bits- I don't know if I've even seen 2,250 bits in my life!- you can find lotsa ways to entertain yourself, and the opening ceremony isn't for another hout. Meet up then? And then we go everywhere together! Yay!" Pathfinder said to her. Snowfall nodded. She was a little disappointed that she'd have to split from the other mare for a while, but she'd bear with it. She was sure she could still have a lot of fun here without Pathfinder. "All right. I'll meet you then, dear," she said, smiling. "I look forward to it." That said, she turned to leave and explore the convention. Snails blushed as the Pathfinder seemed to genuinely enjoy his answers, even if she gave a little tease asking if he crushed on Outback Jack "Umm nope, nope, nope, but th' legendary flutterpony princess in at least one book sounds rilly cute..."
He turned to keep vigil near the door, watching as Rainbow Dash came closer and closer, and watching for Snips. Snails finally noticed a pony of the right shape in a Diamond Dog costume and wearing a fez and vest combo as Zala. The orange unicorn foal bounced up and down "Snips! Ah see ya! Hurry!" Just then, a con staffer put up a sign and closed the door. he peered around the pony and up. "C-c-c-closed?! How kin ya Close!" He stood off to the side, stunned and visibly crushed! What would the convention be without his best bud? What would it be without Rainbow Dash? Pathfinder seemed to be taking this news just as well, and seemed to blink over and get into it with the con staff. He watched with rising hope as Pathfinder found more con badges, and even gave him a reassuring ruffle of his mane. Snails then started jumping up and down, then did a midair flip when Pathfinder reopened the door and smashed the sign for good measure. "YAYYYY! Pathfinder izza real heroine! Come on in Snips!" Watching Pathfinder rocket off to pester another pony, Radiant Chord was left speechless. That pegasus sure is something, she thought, shaking her head slowly as she watched the mare get something from the pony and then dash away to the entrance to the convention. Turning her head back around, she had to trot to catch up to Snowfall, and settled in to walk beside the other pony, taking in the sights and sounds of the convention space for a few moments, still a bit overwhelmed by it all. It was then that Radiant noticed the beautiful pegasus approaching, her mouth twisting into a thoughtful frown. This new pegasus looked familiar, but she couldn't quite place them... at least, not until they spoke. It took a moment, but Radiant's musically trained ear matched that voice to a name, and then a face, and her frown turned into a smile. "Oh, Silver Flash!" she said suddenly, in a tone of voice that clearly said she just made the connection. "I didn't recognize you for a moment." She chuckled, looking the other mare up and down, noticing some distinct similarities between Silver and Pathfinder, at least in terms of appearance. "How is acting going for you?" she asked, with genuine interest. An older sister of hers was an actress as well, though one who was, of all things, more well liked by the griffons than the rest of pony kind. And acting was an art, and like all arts it had been drilled into her since she was just a young foal that anypony who finds their calling in one of the arts is a pony to be respected. It only helped that Radiant actually enjoyed her conversations, few as they had been, with Silver. And suddenly a thought struck her, and she looked questioningly at Silver Flash. "Though I must admit, I am a bit surprised to see you here," she said, tone curious. "I didn't think you would be the type to enjoy such a place... you seemed to enjoy the parties back in Manehatten. And this..." She gestured at the press of convention-going ponies with a hoof. "... is certainly... different... than one of those parties." Eyes widening a bit, she blushed lightly. "N-not that I'm objecting, or anything! It's good to see a familiar face."